T’is the season for Carnival! Anyone familiar with the carnival season knows that the beginning of the year starts with many festive celebrations on Caribbean islands. Of course, one cannot talk about Caribbean carnival without mentioning Trinidad and Tobago. Known for its festive and colorful displays, Trinidad and Tobago carnival is where the community comes together to celebrate its cultural heritage in the present. 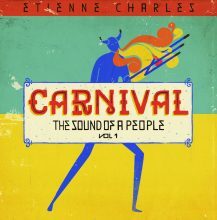 Native Trinidadian jazz trumpeter, composer, and arranger, Etienne Charles offers his newest release, Carnival: The Sound of a People, Vol 1, as a homage to this long-lasting tradition. Although, Charles’ previous albums—Culture Shock (2006), Kaiso (2011), and Folklore (2009), among others—also draw on elements of Trinidadian music, his new project explores the very heart of Carnival, with compositions grounded in aural soundscapes recorded in local communities by Charles and his team. What is the sound of Trinidad and Tobago Carnival? Or better asked, what is the sound of a Trinbagonian people? A common answer is steelpan or steeldrum; however, Charles provides a deeper, more elaborate response to these questions. His mission for Carnival was “to take the sounds, rituals and music, and compose his own sounds, blending it and informing through music, shining light on the things that speak strongly to him and the Trinidad and Tobago community.” While the album blends calypso, jazz, and folkloric genres, the focal point is Charles’ inclusion of the chants of the jab jabs, the sounds of the tamboo-bamboo, the irons, biscuit tins, and steelpan orchestras. The layout of the album adds another layer to the representation of this historical event. Characters such as the Jab Molassie, Moko Jumbie, and Dame Lorraine, as well as the Bois (a stickfighting African tradition brought to the island), are used as song titles. Tracing the transformation from banned skin drums through bamboo percussion groups to steel bands, Charles also presents his “Black Echo” suite, with each of the five movements utilizing different folkloric practices as the musical foundation. Finally, the closing track “Freedom” reintroduces the skin drum(s); as Charles’ states, “When it comes back, we can really celebrate freedom.” A feat which is not only captured on this track, but manifested throughout this album. The celebratory and festive sounds of Charles’ trumpet meet the vibrant percussive sounds by Obed Calvaire (drums), D’Achee (congas) and the Laventille Rhythm Section, and join the joyful sonorities performed by the steel band. Of course, we cannot overlook the contributions by David Sanchez (tenor sax), James Francies (piano), Alex Wintz (guitar), Ben Williams (bass), Brian Hogans (alto sax), Godwin Louis (alto sax), Christian Sands (piano), Jonathan Michel (bass), Sullivan Fortner (piano), Luques Curtis (bass), Jacques Schwarz-Bart (tenor sax), Russell Hall (bass), Corey Wilcox (trombone), Everald “Redmand” Watson (djembe), and Waybe “Lion” Osuna (djembe). Sonically speaking, Carnival: The Sound of a People, Vol 1 presents an exhilarating description of Trinidad and Tobago Carnival. Moreover, it is a great musical masterpiece that is imbued with the cultural sensibilities of the community. This entry was posted in Jazz and tagged Carnival, Carnival: The Sound of a People, CD review, Culture Shock Music, Etienne Charles, Jamaal Baptiste, Jazz, Trinidad by aaamc. Bookmark the permalink.